Carbonnade Flamande is a flavoursome Belgian, sweet-sour beef stew, made with beer and it’s often accompanied by french fries. You can easily find this delicious meal in restaurants in Belgium. This recipe will win you over in one bite! A handful of parsley, chopped. Marinate the beef overnight in the ale with the garlic and bay leaves. The next day, drain the beef from the marinade, reserving the marinade. Pat the meat dried with kitchen paper and toss it in the seasoned flour until evenly coated. Shake off any excess flour. Heat 2 tbsp of the olive oil in a large flameproof casserole until hot. Fry the beef in 3-4 batches for about 5 minutes per batch, stirring occasionally until it is a rich golden brown all over. You may need to add a little more oil between batches but make sure it is hot again before adding the next batch. Remove the meat with a slotted spoon to a plate and set aside. Don’t worry if the bottom of the casserole is starting to brown, this all adds to the flavour of the finished dish. Lower the heat to medium and fry the pancetta in the casserole for 6-8 minutes, stirring occasionally, until crisp and golden. Scoop the pancetta out with a slotted spoon and set aside with the beef. Preheat the oven to fan 140C/conventional 160C/gas 3. Tip the carrots, onions, and leek into the casserole and fry, stirring occasionally, until they start to brown – this takes about 12 minutes. Spoon in the tomato purée and continue to cook for 2 minutes, stirring constantly. Add the beef and pour in the reserved marinade. 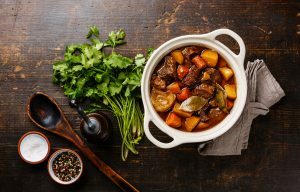 Bring to a simmer, scraping any sticky bits off the bottom of the pan, then add all the beef stock and bouquet garni to the casserole. Season with salt and pepper and bring everything to the boil. Remove from the heat. Cover with a lid and cook in the oven for 2 hours, stirring once halfway through. (The carbonnade may now be left to cool and frozen for up to 1 month. Add 100ml more bone broth or stock to the sauce when reheating.) When the beef is ready, taste for seasoning and add more salt and pepper if you think it needs it. Scatter the chopped parsley over the top and serve straight from the casserole, with creamy mash or jacket potatoes and buttered greens or cabbage. * Fancy keeping the international theme going? Try our Russian Borscht on for size.